When I set out to make apple butter, I had it in my head that I just had to make cornmeal waffles to be the vehicle for my apple butter. Cornmeal waffles? I’ll attempt to explain. A while back I came across a book. 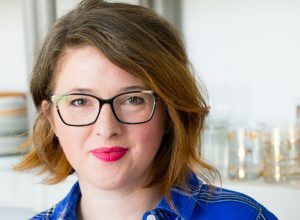 More specifically, a romance novel (if you get my drift) in which the main character who loved cooking (among other things) made a crock pot full of apple butter and served it on cornmeal waffles. I don’t have any clue – none at all – why this stuck in my head. But it did. It sounded amazing. 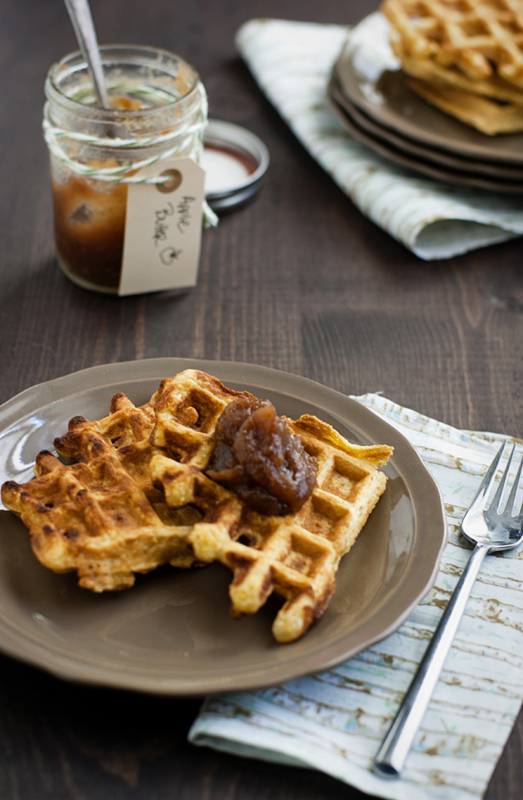 Also, it is admittedly odd that apple butter on cornmeal waffles is the detail from the book that stuck in my head. I really do have a one track mind – and it’s food apparently. Turns out though that the book was actually pretty darn entertaining and I have read it several times since. Problem was, I didn’t have a cornmeal waffle recipe. Also, did I mention that I didn’t even have a waffle iron? I know. I really was coming at this from a bizarre angle. Well, a quick text to my sister (who doesn’t even question my random requests anymore) landed me the waffle iron and a quick search on Google turned up a ton of cornmeal waffle recipes. After looking at several recipes, I settled on the one from King Arthur Flour. I love their flour so I figured that was a good place to start. I tweaked a few things in the recipe (although not much as it seemed pretty solid) and it turns out, not having had a waffle iron for the past 7 years has been a mistake. A huge mistake. I need to get my own – immediately. These waffles turned out just the way a waffle should. Thick, slightly crunchy, but warm and soft at the same time. The cornmeal gave a great texture to the waffle itself and topping it off with the spicy/sweet apple butter – unreal. I recommend you follow your own waffle iron’s instructions when making these as there can be a great variation in waffle ironing methods. 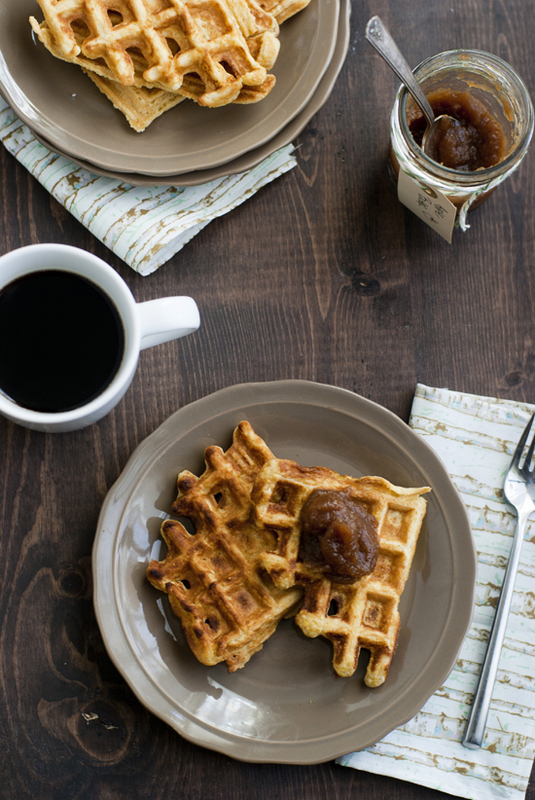 Make these soon, even if you have to beg, borrow or steal a waffle iron to do so. Well, maybe not steal. That could get ugly. Hopefully you have a sister who is as lovely as mine who will let you borrow hers. That is, if you’re weird like me and don’t have one to begin with. 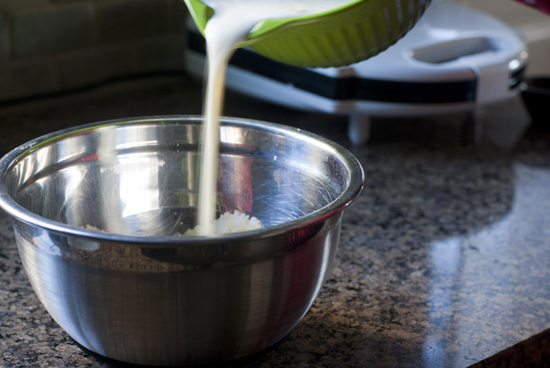 In a medium-sized mixing bowl, whisk together the buttermilk, eggs and melted butter. Set aside. 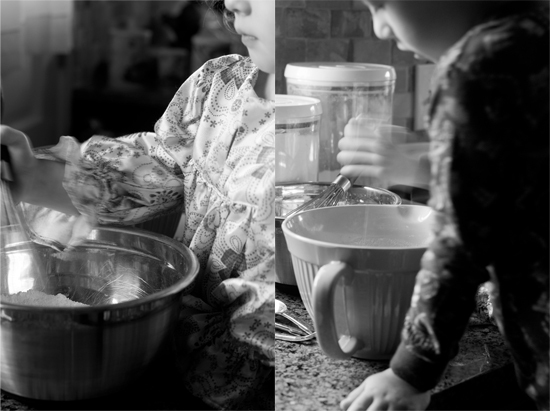 In a separate bowl, whisk together the dry ingredients, then quickly and gently combine the wet and dry ingredients. 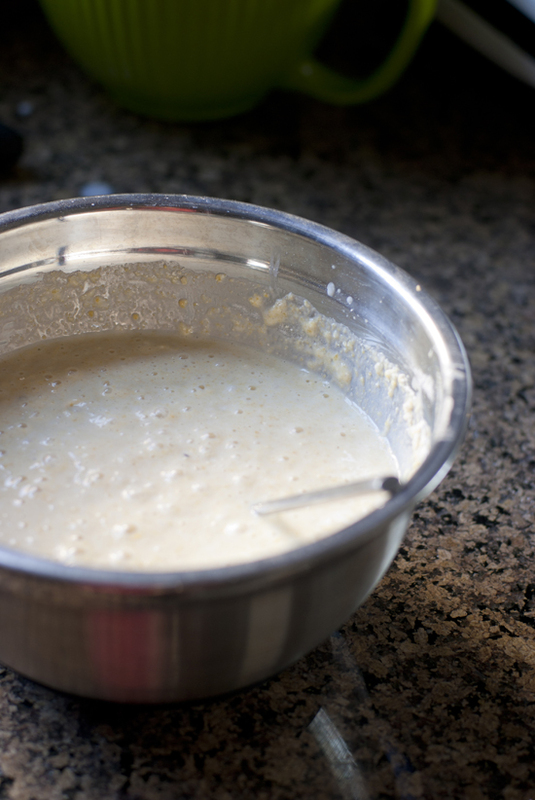 Let the batter sit at room temp for 10 minutes, to allow the cornmeal to soften. 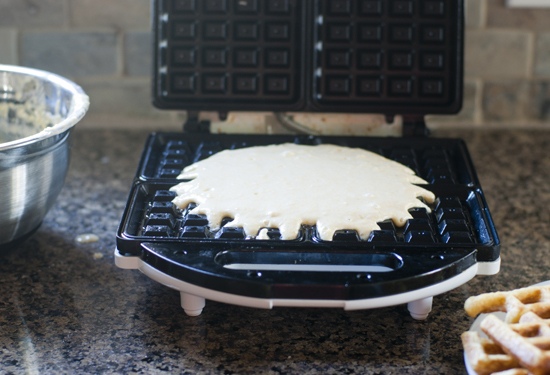 Drop the batter by 1/3-cupfuls (if making round waffles) or ½-cupfuls if making rectangular waffles onto a hot waffle iron (prepared by your waffle irons’ instructions), and bake until the waffle iron stops steaming. 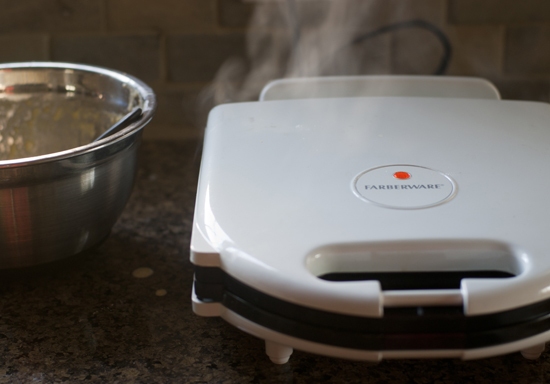 Funny as soon as I saw this on Foodgawker, I thought, “I need to get a waffle iron”. I heard the siren call…..
I’m so glad it spoke to you, too! just stumbled on your blog! good work, keep it up! i’d been thinking of pancakes this weekend, but this post has me thinking waffles. have you ever experimented with savory waffles? Thanks for stopping by and saying hi! It’s funny that you brought up savory waffles, because last year at our Family’s anual Christmas Eve Cooking competition, my husband and brother in law created these sourdough waffles with white cheddar cheese and a savory compound butter with sauteed mushrooms. They were delish! I have been toying around with recreating them and posting about them. I bet I can borrow my sister’s waffle iron a bit longer 😉 thanks again and have a happy weekend! hey, do you still have my waffle iron? Ha! I totally do! How’s the Mickey one working out? I’ve only used it once, but the waffles totally look like the bigger ones from Disney World. Not the little ones that they have at all the buffets (that I ate like 25 of while I was there), but the bigger ones like they had at our hotel (only 1 victim while we were there). I need to make them again and use the secret formula Sus found. The first go-round was just Bisquick (didn’t want to waste the fancy flour in case the waffle iron was wonky).